LaQeta Lanett Kemp is a software engineer for a government contractor that is also a renowned information technology company and leader in national intelligence, homeland security and information technology management. In her capacity, she is responsible for creating informational and collaboration websites and portals, working with senior collection government teams to organize and provide situational awareness intelligence, and coordinating and submitting information via collaboration portals and systems. Ms. Kemp served in the U.S. Air Force from 2000 to 2008, and worked for the U.S. Army from 2004 to 2009. She is currently working for the Office of the Director of National Intelligence. She was inducted into the Golden Key International Honour Society, and she has named critical success factors in her life as being her goal-oriented nature and sheer determination. 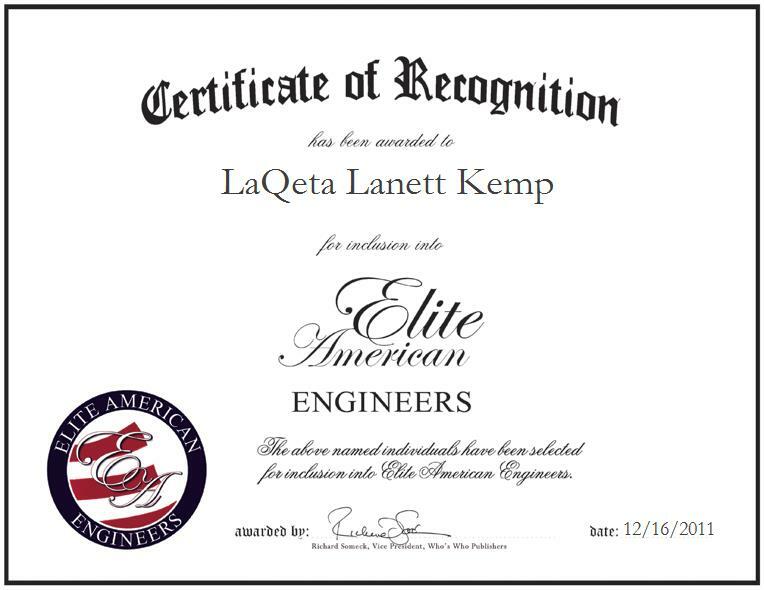 LaQeta Lanett Kemp was originally selected for inclusion in Elite American Engineers in December, 2011. We are proud to be featuring Ms. Kemp again in Elite American Engineers for 2012/2013.